The sink, especially the kitchen sink, is one of the most important workhorses in your home. When your kitchen sink breaks down, the flow of the household shuts down, often causing major inconveniences. Replacement may be required, but it is a good idea to call a professional and see if drain repair is possible. When it Comes to Drain Repair, We Handle it All! At JB Plumbing and Rooter, our licensed plumbers have worked on just about every conceivable sink repair and sink replacement job. 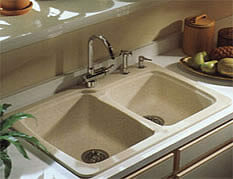 Let us take a comprehensive look at your sink problem, and fix it properly and quickly. Do you have a leak somewhere in your sink, but don’t have the time to fix it? Have you tried repairing it yourself, but have run into questions or perhaps additional problems you can’t answer? Decomposition over time, vibrations and bumps, and continual expansion and contraction from hot and cold water causes sinks to break down. Some fixes are easy, such as installing a new sprayer or tightening a pipe fitting or two. There are a lot of good reasons to use a licensed Los Angeles plumber to repair or replace the various kinds of sinks in your home. What appears to be a simple leak can actually be complete drain trap failure.